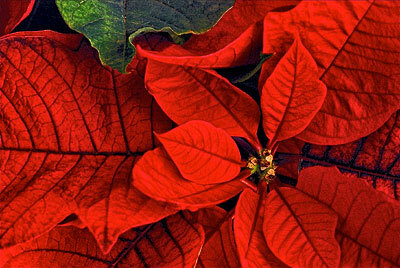 Today, the poinsettia is the number one potted plant sold in the United States. And, that’s over a very small six-week window! It is thought that Franciscan monks were the first to begin using poinsettias at the holidays to decorate nativity scenes in Taxco, Mexico. They are named for the first U.S. Minister to Mexico, Joel Roberts Poinsett a member of the United States House of Representatives who discovered it and sent samples back to the United States. The rest is history as they say; the showy red, white and variegated poinsettias are Christmas icons and popular holiday plants. But eventually the leaves will start to drop off and very few of the millions sold, ever make it to a second Christmas. While we enjoy them over the holidays, getting them to bloom again it is a challenge. But what many perceive to be flowers are really the colorful bracts. If you plan to return them to their Christmas glory next year, cut the stems back to four to six inches. Keep the soil fairly dry, and the plant warm until new growth occurs. In the spring you can then plant in the garden in a sunny spot. Add a light amount of fertilizer in the spring and summer and if you’re up to the task, restoring a healthy green poinsettia plant back to its original color is no problem if you follow these few simple rules. Assuming you’ve cut the plant back and fertilized it once per month until spring, it can be planted in the garden after all danger of frost has passed. You can then enjoy it throughout the rest of spring and summer before the real work begins. Poinsettias (Euphorbia pulcherrima) need total darkness, for 14 hours each day, starting about eight weeks before you want to display them. During the day, the plants need bright light, along with the other routine care. However, starting in the evening, the plants must get complete darkness. Even a nightlight can disrupt this process! Depending on where you have the plant (planted outside, or in a pot indoors), will determine how you approach this process. I’ll let you decide that. These plants are photoperiodic which means they respond to day length. So, dig them 8-10 weeks before Christmas and place them in a location where they receive 12 hours of total darkness each day. This may be accomplished by placing a box over the plants or by placing them in a closet or unlighted basement area. Be sure they get an equal amount of daylight and darkness each day and the bracts will start to turn color in about four weeks, and continue if you carefully keep up the process they should be colorful and ready to enjoy by the following Christmas. Poinsettias need a humid environment during this time, but be careful not to spray the foliage directly, as you may invite leaf spot…not a desired feature on such a showy leaf! In about eight weeks, the bracts should be completely colored, if you’ve followed the above guidelines. They’ll stay this way for several weeks, at least until after Christmas. Come next October, start the whole process over again! Hi – some say you need 14 hours darkness and others equal hours of light and darkness. Which is best……. When you say sunlight, is it direct sunlight or just the reflected light like through a window? Direct sunlight if it is outside or inside through a window will also work. Thanks!! I didn’t know this and will definitely try.